ISIS Claims Responsibility For Deadly Attack Aimed At Afghan Hazaras : The Two-Way The attack on a gathering of the mostly minority Shia community is the latest in an upsurge of sectarian violence in Afghanistan in recent months. 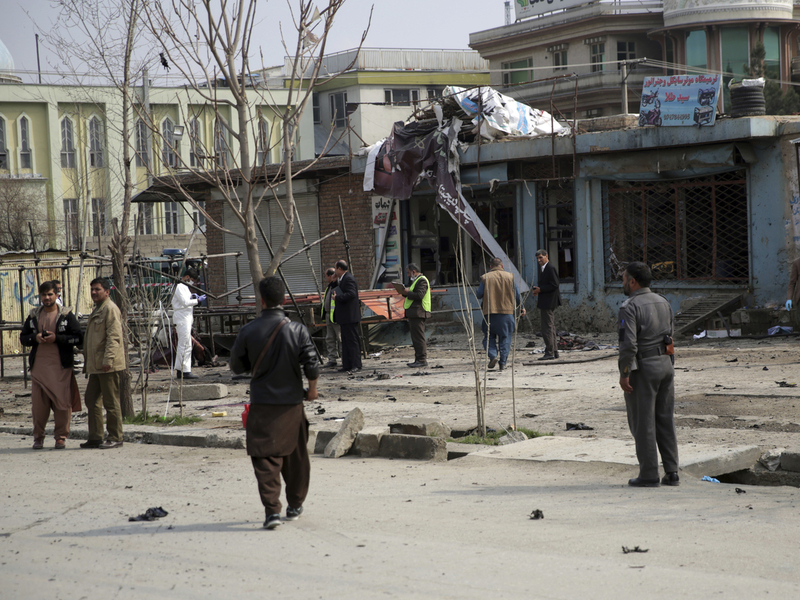 Security personnel inspect the site of a suicide attack in Kabul, on Friday. A suicide bomber attacked a police checkpoint in the Afghan capital Friday, killing at least nine people and wounding 18, officials said. Islamic State militants claimed responsibility. The attack took place near a gathering commemorating the death of Abdul Ali Mazari, a leader of the mainly Shia Hazara community in Afghanistan who was killed by the Taliban in 1995. As NPR's Diaa Hadid reports from Islamabad, "Images from the scene showed men sprawled on the ground. The body of one man was badly mangled around metal bars." At least one policeman and six civilians were among the dead and 15 civilians wounded in the Mosalla-e-Mazari area of Kabul, Najib Danesh, an Interior Ministry spokesman said. A spokesman for the Kabul police chief said the bomber was stopped at the checkpoint near the gathering when he detonated explosives. As Reuters writes, "While Afghanistan, a mainly Sunni Muslim country, has not seen the level of sectarian violence common in Iraq, attacks on [Shia] targets have become increasingly common. Over the past two years, a string of attacks on [Shia] mosques and Hazara gatherings have been claimed by an affiliate of Islamic State." In December, ISIS claimed responsibility for an attack that killed dozens of people at a Shia cultural center. More generally, Afghanistan has witnessed an upsurge in violence in recent months. In January, a Taliban attacker drove an explosives-laden ambulance into the heart of the capital, killing more than 100 people and wounding as many as 235. The following day, 11 soldiers were gunned down at a military academy in Kabul. According to The Associated Press, the Taliban are believed responsible for "a deadly assault overnight on an army outpost in a remote region of Afghanistan's northern Takhar province, killing six soldiers and wounding five in a blistering hours-long attack, Defense Ministry spokesman Dawlat Waziri said."